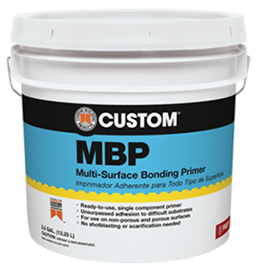 MBP Multi-Surface Bonding Primer is a single-component, water-based primer engineered to deliver superior adhesion on a variety of substrates where proper bonding is difficult. Specially formulated with aggregates and polymers to promote mechanical adhesion on non-porous substrates. A waterproof, vapor-proof uncoupling membrane that can be used for crack-isolation in most tile, porcelain or natural stone installations, and can be applied over challenging substrates such as installation over green (young) concrete and single ply 19.2" (49 cm) o.c. wood framed floors. RedGard® Uncoupling Mat is designed differently than bonded membranes. When exposed to excessive substrate movement it absorbs stress and preserves the surface and integrity of the tile. RedGard® Uncoupling Mat's bonding layers have reinforced fleece which locks mortar into the mat, ensuring strong, reliable installations. A self-bonding, fabric-reinforced asphaltic mat that reduces crack transmission in tile and stone floors. For both full and partial floor applications, Crack Buster® Pro is an anti-fracture membrane for horizontal cracks up to 3/8" (9.5 mm). Its strong self-adhesive backing and uniquely designed surface provide secure bonding for all types of ceramic tile, natural stone and terrazzo. JAMO’s Waterproof formula dries 30% faster and is easier to spread. It is a ready-to-use, elastomeric, waterproofing and anti-fracture membrane. Easily applied with roller, trowel or sprayer producing a continuous moisture barrier with outstanding adhesion. Reduces crack transmission in ceramic tile or stone floors. Meets ANSI A118.10 for waterproofing membranes. Meets Uniform Plumbing Code specifications for use as a shower pan liner. Listed with IAPMO R & T, File #4244 UPC® . ICC-ES ESR-1413. Listed with IAPMO R&T, File # 4244 UPC® . ICC-ES ERS-1413. Miami – Dade County Product Control Approved. A flexible, seamless waterproofing membrane with a liquid-applied polymer and reinforcing fabric that bonds to a variety of substrates and is ideal for heavy duty service installations. Designed for waterproofing tile and stone installations, Custom® 9240 also provides protection from fractures to 1/8" (3 mm) over shrinkage and other non-structural cracks. Ready-to-use, elastomeric, crack prevention membrane developed for protecting tile floors from cracks due to minor surface movement. Provides anti-fracture protection of up to 1/8" (3 mm) over shrinkage and other nonstructural cracks. Suitable for all interior or exterior commercial and residential tile and stone installations. Easily applied with a roller or trowel. Meets A118.12 for crack isolation membranes.